Long-time tennis partners Treat Huey and Dominic Inglot stunned top seed and defending champion Alexander Peya of Austria and Bruno Soares of Brazil, 7-5, 5-7, 10-8, Friday to capture the Aegon International doubles title at a grass court in Eastbourne, Great Britain. 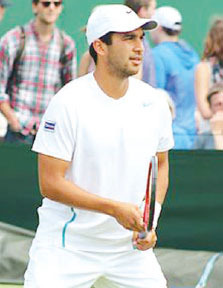 The Fil-American Huey and the British-born Inglot survived a hectic day that began with 7-6 (2), 6-3 semifinal victory over the wildcard pair of Colin Fleming and Ross Hutchings to nail their first title win on grass. The semifinal win of Huey and Inglot was actually a continuation of their affair which was suspended on Thursday due to darkness, before edging out the fancied team of Peya and Soares in the final. "They’re a really tricky team," said Inglot in an interview to ATPWorldTour.com. "We've played them numerous times and we've pushed them to three sets but have never won. To come through on a final was really satisfying and a big confidence-booster going into Wimbledon." Both are aiming to use the title win as a springboard to their Wimbledon campaign this week. They made it to the third round – their best feat so far – in last year’s edition of the said Grand Slam. En route to the final, Huey and Inglot upset second pick Leander Paes of India and Aisam Qureshi of Pakistan, 6-4, 6-3, in the quarterfinals, and Great Britain’s Jaime Murray and Australian John Peers, 6-3, 7-6 (4), in the 16-pair draw. Huey and Inglot also claimed their third crown as a tandem following title victories in the 2013 Swiss Indoors Basel in Switzerland and the 2012 Citi Open in Washington DC.